Charles Ryrie once wrote, “Everyone is a theologian—of one sort or another.” Each person’s theology is a combination of what we believe and how we live out those beliefs. This book attempts to help Christians build confidence in their knowledge of the Scriptures and, through that, live a life where they regularly come to know Jesus better and love him more. 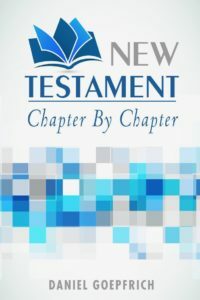 No matter what level of Bible study you are doing – from the simplest overview to more technical exegesis – in New Testament: Chapter by Chapter you will find something to help you “in your pursuit of knowing our Lord Jesus Christ more intimately” (2 Peter 1:8).